Connemara West plc welcomes the inclusion of its education-led development strategy as one of the case studies in the government’s National Planning Framework, which was launched as part of Project Ireland 2040 in Sligo Institute of Technology by Taoiseach Leo Varadakar TD on Friday February 16th. Project Ireland 2040 is the government’s overarching policy initiative to provide comprehensive social, economic and cultural infrastructure for Ireland up to 2040 and has two parts – the National Planning Framework to 2040 and the National Development Plan 2018-2027. Commenting after the launch of Project Ireland 204, Dr. Kevin Heanue, Chairman of Connemara West plc said that “our education-led development strategy is well-positioned to contribute to the government’s key strategic outcome of strengthening rural economies and communities”. The education-led development strategy is based on developing partnerships with colleges from the United States to help them base their global learning experiences in Tullycross in North West Connemara. These deep collaborative relationships with the colleges ensure maximum economic, social and cultural impact for the local community. Over the next few years the number of colleges coming to the village will increase and a new Residential Education Centre will be built. Established in 1971 on foot of a local fundraising drive, Connemara West which is owned by 500 local shareholders is a locally-managed community development organisation based in Letterfrack, Co. Galway and directly employs 28 people. The potential of such education-led development is gaining recognition. In the Government’s action plan for rural development titled Realising our Rural Potential launched in January 2017, Action 165 focuses on examining the potential to promote rural Ireland as the destination of choice for US colleges wishing to avail of a rural- based learning or study abroad experience. 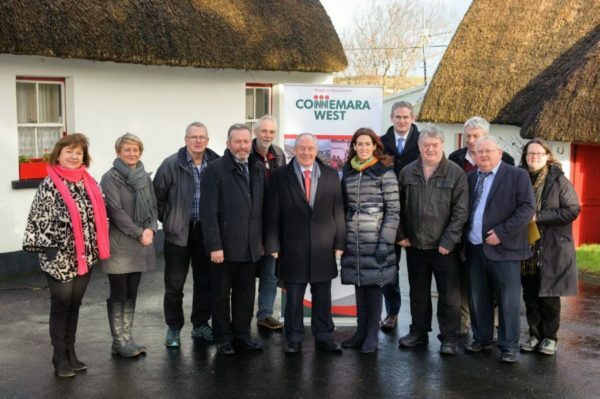 Connemara West is involved in that action together with Galway County Council and the Western Development Commission. “We had a very positive visit from Ministers Micheal Ring TD and Sean Kyne TD to Tullycross on January 19th to discuss the next steps in our strategy particularly in terms of required infrastructure needs” said Dr. Heanue. “We look forward to working with them and other stakeholders to roll out the next phase of this innovative economic development model as soon as possible”.